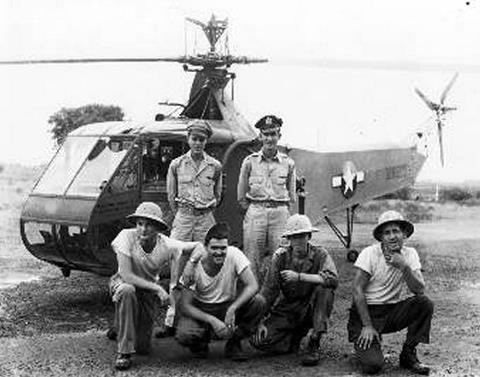 Today in aviation history: April 25-26, 1944- First AAF helicopter combat rescue. Lt. Carter Harman of the 1st Air Commando Group (standing in photo), flying a ...Sikorsky YR–4 helicopter, rescued four men from the Burmese jungle in the first Army Air Forces combat rescue by helicopter. In late April 1944, a 1st Air Commando light plane crash landed deep behind Japanese lines in Burma with three wounded British soldiers aboard. Lt. Harman flew his helicopter from his base in India on a circuitous 500 mile route to avoid the Japanese. He had to stop for fuel every 100 miles at landing zones torn out of the Burma jungles and controlled by friendly ground commandos. He then flew to a clearing near the crash site to pick up the first wounded British soldier and took him to an emergency strip prepared by British commandos on a sand-bar 10 miles away. He went back and picked up the second wounded soldier, but an overheated engine forced him to remain at the sandbar overnight. He went back the next morning to get the third wounded soldier and then went back again and got the L-IB pilot. "Whatever can be said about the Huey, double it for the H-34"
Duane Keele, former USMC and Air America H-34 pilot.